I love a good baked chicken recipe and this one certainly did not disappoint! Two of my favorite combos, pretzels and honey mustard served together with chicken? Yes! It was so good, even my toddler loved it. This will be on the menu again soon! Add your honey mustard to a large bowl. In another bowl, mix pretzels, paprika, onion powder, and garlic powder. Dip each chicken breast in honey mustard. Then dip the chicken in the pretzel mixture, making sure both sides get well-coated. Place on baking sheet. Repeat with remaining chicken. Spray tops of chicken lightly with cooking spray. Bake for 20-25 minutes or until pretzel coating is browned and chicken is thoroughly cooked. Slice and drizzle with extra honey mustard. Enjoy! Oooh....this looks great! I'm going to give it a try this weekend. Thanks for sharing! Yum! This looks amazing, can't wait to try it! Stopping by from Showcase Your Talent! 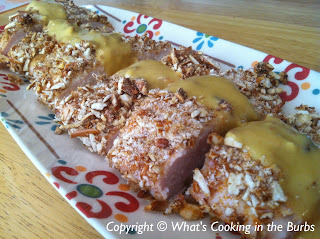 The pretzel coating with honey mustard is a winner.Thanks for adding it to Foodie Friday!